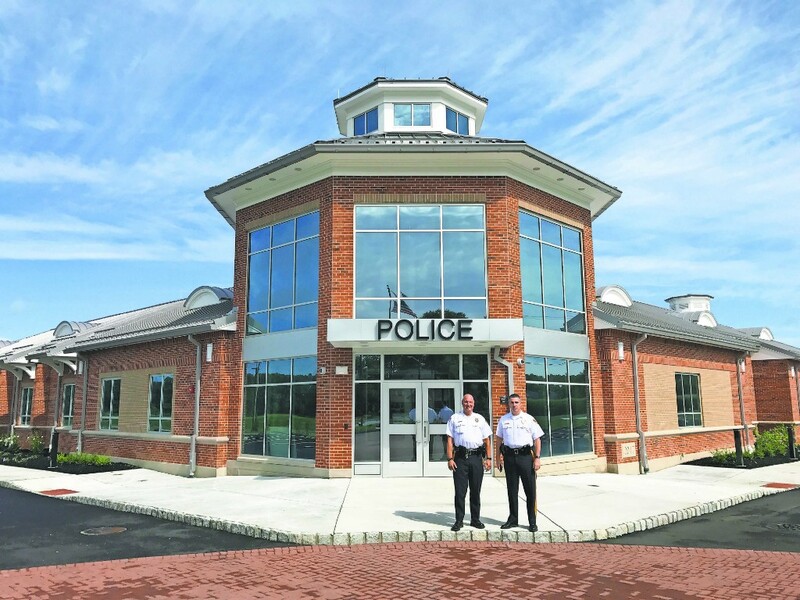 Lieutenant Ronald Cundey (left) and Chief of Police Thomas Mills stand at the front entrance of the new Harrison Township Police Department, located at 199 Colson Lane, Mullica Hill. From approximately 1,100 square feet to almost 11,000 square feet, the Harrison Township Police Department is making a much-anticipated move within the next couple of weeks. After four years of planning, the administrative office will soon be located at a new address, 199 Colson Lane, Mullica Hill. The $5.25 million facility features elements of security, efficiency and opportunity for expansion, allowing the department to serve the community more productively and professionally. According to Chief of Police Thomas Mills, when the department moved into the 137 N. Main St. location in 2000, it was meant to be a five-year location while a new building was planned in 2005. However, with the peak of the recession and finances growing tighter, the plan never moved forward. Before the move, the department’s building could allow for six or seven employees to work efficiently at one time, Mills said. In the new building, Mills expects more than 20 employees to work cohesively at anytime. The department, which employs 19 full-time officers and two part-time officers, is hoping to expand as the surrounding area and township continue to develop. Mills said the new facility was built with this growth in mind, as well as the obtainment of agency accreditation. According to Mills, one of the requirements for accreditation is to have a facility in working order with standards and procedures being followed through. According to Deputy Township Administrator Dennis Chambers, the township hired a law enforcement consultant, David Undercuffler, during the planning stages of the facility. Undercuffler was a retired police officer of more than 30 years, as well as a key member in the planning, design and construction of the Pennsauken Police Department building. “This was key to dealing with the department of corrections and juvenile justice when it came to their strict design standards for prisoner containment and processing,” Chambers said. Once the contract was awarded, Chambers said, the township hired Envision Consultants LTD as a construction management firm to manage and track the day-to-day process between the general contractor, Arthur J. Ogren Inc., and township representatives. “Everyone has done an outstanding job on the facility and worked with the township on various issues to keep the project on track and under budget,” Chambers said. Whereas the North Main Street location had little room for officers to process arrestees, conduct interviews, even change clothing privately or have private conversations, the new station includes separate men’s and women’s locker rooms, multiple interview rooms, a conference area, a training room and more. The main lobby is equipped with security features and allows visitors to safely conduct business with the police department. The new building also includes secluded cells and a processing room where those brought into the station by police are safely disconnected from the general public. The new building shares a driveway and parking lot with Harrison Township Public Works, while also being located one-quarter mile from four Harrison Township schools. The new location will become fully functional within the upcoming weeks, Mills said. Contact information for the staff is expected to remain the same, however Mills encourages residents to follow the department’s Facebook page for updates.